Is there a better food for a cold day than pasta? As I always say, pasta is the ultimate comfort food. 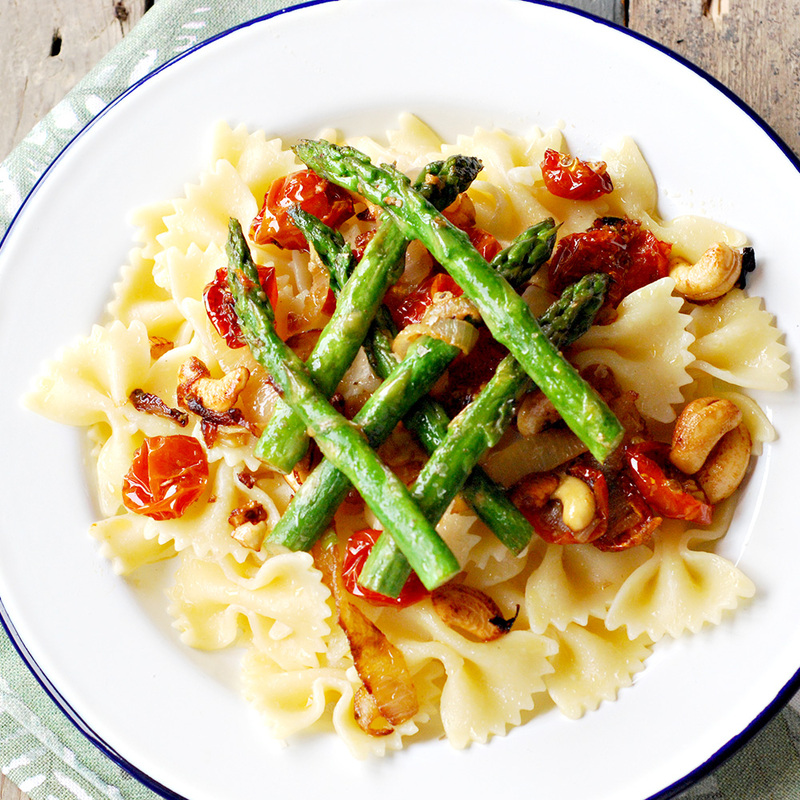 This recipe is light and tasty, the cashew crunchiness together with the tenderness of the sun blushed tomato and the asparagus is to die for. This is a easy and yet delicious recipe that will bring you joy and happiness. I dried my tomatoes on the food dehydrator but you can buy it if you want, just drain some of the olive oil from if for a healthier result. Cook the pasta in salted water as per the package instructions. Fry the onions and garlic for 3 minutes, add the cashew, paprika, marmite and cook for another 5 minutes. Add the tomatoes and the asparagus and cook for 3 minutes. When the pasta is cooked drain the water and add the margarine, stir until its melts. Mix the pasta with the asparagus mixture gently, sprinkle smoked sea salt, olive oil and serve. This recipe serves 4 people. Enjoy! Amazing sounding recipe and looks delicious however just curious cos I hate marmite, what’s the marmite for? Can you taste it in the dish? Hi Amber, thanks for your comment! I used marmite for flavour and even though it won’t be too strong, you would still be able to taste it. It won’t compromise the recipe if you do without though. Thanks!